Looking for today’s hottest new releases and some of your favorite classics? We got it! Looking for adult movies, lingerie and novelties? We got that, too! 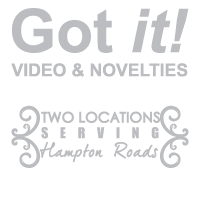 Got It Video & Novelties is your one stop entertainment shop in Hampton Roads, with the largest selection of adult videos, toys, lingerie and more. And if you can’t find that one item you’re looking for, we can always special order anything your heart desires. Not quite ready for that yet? That’s okay, we also rent today’s hottest new release DVDs, you know, the non-adult kind. Or if you’re a little shy, you can always shop right here online. No matter what you need, you can always get it at Got It Video & Novelties.